Acclaimed as “one of the top 50 Very Important People Shaping Life in Hampton Roads” and voted “Readers’ Choice Man of the Year” by Coastal Virginia/Hampton Roads Magazine, Michael Paul Curry has enjoyed a distinguished career as an impresario/art presenter and gallery director for more than four decades. He was named “one of the 20 people who have made the most difference in Hampton Roads (Southeastern Virginia’s metro area) over the past twenty years” by Portfolio Weekly Magazine and “one of the culturally important people ” by VEER Magazine. He has been presented to Her Majesty Queen Elizabeth II and HRH The Duke of Edinburgh, His Holiness the XIVth Dalai Lama and President Barack Obama. Having retired as the City of Hampton’s Arts Director in 2012 (after 25 years or service), he is enjoying life as a consultant, organic gardener, writer and volunteer in the Emergency Room at Adventist Hinsdale Hospital. Michael Paul Curry was appointed founding director of The Hampton Arts Commission in Virginia (1988) and The Hampton Arts Foundation (1994). Under his leadership two of Hampton’s most historic buildings – The Charles H. Taylor Arts Center (1925) and the American Theatre (1908) were saved, restored and reinvented as vibrant centers and incubators for world class performing and visual arts. Prior to that, Michael founded and directed the Fine Arts Foundation of Lafayette, Louisiana (1974 -1988). He has presented many of the most celebrated artists of our generation. He has the rare distinction of having produced three major Ballet Galas starring the superstars of ballet in the 20th century – Alexander Godunov, Mikhail Baryshnikov and Rudolf Nureyev. As Producing Director, Michael staged productions in Lafayette, Louisiana; at Actors Theatre of Louisville, Kentucky; at the 50th Edinburgh International Fringe Festival in Scotland and at the Virginia International Arts Festival in Norfolk, Virginia. He spearheaded two successful major capital campaigns as well as the annual campaigns and directed several Galas at the restored American Theatre which is acclaimed as a “gem”, the “Jewel of Hampton” and “Hampton Roads’ favorite performing arts venue “. He began his career as an Assistant Stage Manager at the Chelmsford Civic Theatre in his native England. He was educated at the Royal Masonic Schools where he was Principal Bass in the orchestra, organist for chapel services, and accompanist for choral activities. He also took leading roles and co-directed several of the school’s dramatic productions. Following his “gap” year, he undertook a three year course at the University of London, studying English, French and Law. Michael has received dozens of prestigious awards and proclamations. He has served on numerous Boards and committees. He is listed in the premiere edition of Who’s Who in Entertainment and in Who’s Who in the South and Southwest as well as in the International Dictionary of Biography. He has had the honor of receiving teachings from His Holiness the Dalai Lama in Atlanta, Mexico City, Washington D.C., and in India at Sarnath and Drepung Loseling Monastery. 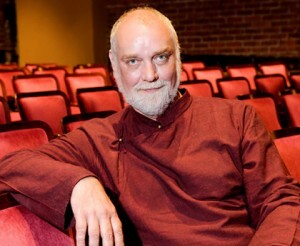 The Hampton Arts Foundation named the auditorium of the American Theatre in his honor in 2012.